If you have ever slept in your contacts, worn your lenses for some days or didn’t clean them properly, pay attention – a girl has permanently lost her sight after keeping in her contact lens for 6 months. Lian Kao, a 23 year old student from Taiwan, left her disposable contacts in for six months, not once removing them to clean them and became infected by a microscopic single-cell amoeba that ate away her cornea. Contact lens wearers are at high risk of developing eye infection, because the lenses strip all the moisture from the eye preventing the cornea from getting the nourishment it needs. By keeping her contact lens in continuously, Kao’s eyes didn’t receive the oxygen they required, causing her eyes to become irritated and teeny wounds to emerge on her cornea. This issue was exacerbated when Kao’s eyes came in contact with water, such as when she showered or swam. Contact lenses act as sponges in water making them a perfect breeding ground for parasites and germs. 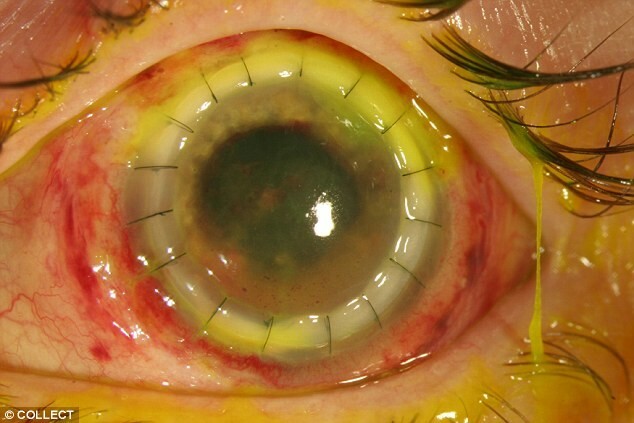 The bacteria Acanthamoeba thrives in water and infected the surface of Lian Kao’s eyes between the cornea and the contact lens. By the time doctors removed the contact lenses, the amoeba had already eaten Lian Kao’s cornea, and they were unable to reverse her blindness. In less dramatic cases, not taking proper care of contact lenses will cause different types of infection like pink eye. It’s vital for all contact lens wearers to attend to their eye health and hygiene. Following these guidelines will assist you to avoid eye issues. Follow the cleaning instructions for your contact lens. Properly cleaning the lenses will remove harmful bacteria thus preventing contamination. Store contact lenses properly & replace your contact lens case regularly. Dirty or old cases can cause eye infections. Do not wear your contact lens in a wet environment. No pools, no showers, saunas or hot tubs – that’s where eye-eating bacteria thrive! Do not sleep in your contact lenses. This can reduce the amount of oxygen your cornea receives thus increasing risk of permanent cornea damage. Throw away old contact lens – do not over wear your lenses. Wearing them for longer than needed can lead to eye irritation and infection. Do not wear your contacts more than 8 hours a day. Better yet, wear your glasses! Uggghhhh! That is seriously freaky! Yikes! I am never ever sleeping in my contacts again!